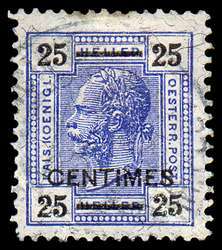 Austria Offices Abroad: Crete Scott #10, 1905 25c on 25h ultramarine Emperor Franz Josef Surcharged. Used VF, presumed CTO. Postmark is full, but too light to read. Austria Offices Abroad: Crete Scott #20, 1908 1fr brown, gray paper Emperor Franz Josef. Used Fine. 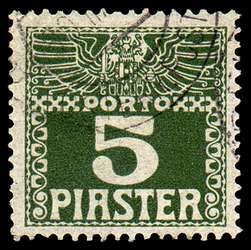 Some paper remnants on reverse, perhaps postally used. 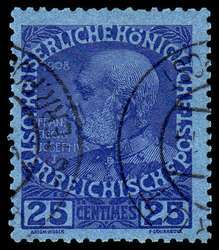 Austria Offices Abroad: Crete Scott #22, 1914 25c ultramarine, blue paper Emperor Franz Josef. Used F-VF+, presumed CTO. Scott 2006 value $190. 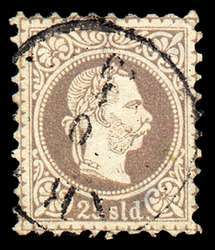 Austria Offices Abroad: Turkish Empire Scott #6, 1904 2fr on 2k Emperor Franz Josef. Used F-VF. 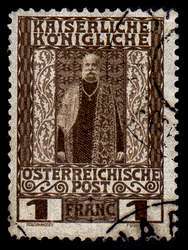 Austria Offices Abroad: Turkish Empire Scott #6, 1904 2fr on 2k Emperor Franz Josef. Used F-VF with small defects. 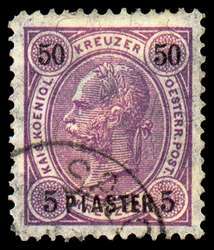 Austria Offices Abroad: Turkish Empire Scott #7J, 1883 25sld lilac Emperor Franz Josef. Used looks VF, thin. Scott 2006 value $350. 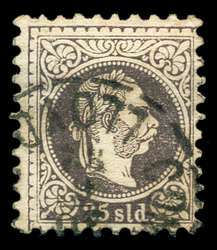 Austria Offices Abroad: Turkish Empire Scott #7D, Used VF with thin. 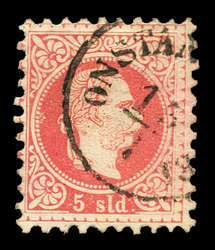 Austria Offices Abroad: Turkish Empire Scott #7E, Used VF with tear. 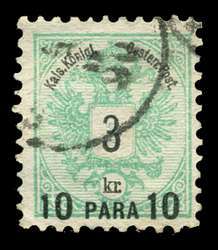 Austria Offices Abroad: Turkish Empire Scott #15, 1888 10pa on 3kr green Coat of Arms. Used XF. 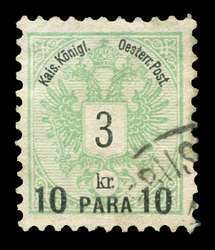 Austria Offices Abroad: Turkish Empire Scott #15, 1888 10pa on 3kr green Coat of Arms. Used F-VF. 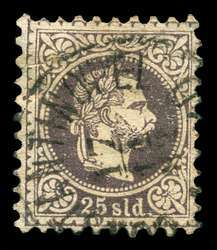 Austria Offices Abroad: Turkish Empire Scott #25, 1890 5pi on 50kr violet Emperor Franz Josef Surcharged. Used VF. Some paper remaining on back, thus may actually be postally used. 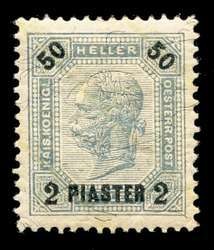 Austria Offices Abroad: Turkish Empire Scott #35, 1900 2pi on 50h gray blue Emperor Franz Josef. Mint Superb. 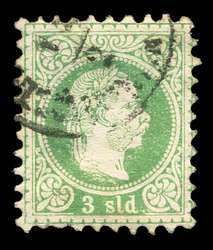 Austria Offices Abroad: Turkish Empire Scott #J11a, Thin Ordinary Paper, 1908 5pi dark green Postage Due. Used VF.